The Hon. 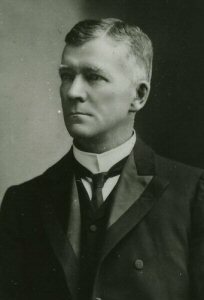 Tetley Gant was elected President of the Legislative Council of Tasmania in 1901. He was part of the prominent Gant family from Bradford in Yorkshire, and was also connected to the Tetley family of brewers. GANT, TETLEY (1853-1928), lawyer and politician, was born on 19 July 1853 at Manningham, Yorkshire, England, son of James Greaves Tetley Gant, solicitor, and his wife Sarah Ann, nee Gaunt. He was educated at Rugby School and St John’s College, Oxford, (B.A., 1877; M.A., 1879), where he rowed and played cricket for the college. At the Inner Temple he formed a close friendship with Tasmanian-born (Sir) Elliott Lewis before being called to the Bar in 1883. Next year he migrated to Hobart where he was admitted to the Supreme Court of Tasmania and in 1888 entered into partnership with Lewis. On 19 July 1882 at St John’s Church of England, New Town, he married Frances Amy Roope, daughter of a well-to-do Hobart merchant, whose fine New Town residence, Wendover, was for a time the Gants’ family home. Gant died on 7 February 1928 at Lower Sandy Bay. His obituarist in the Mercury described him as ‘an ideal English gentleman … He had a fine personal presence, was debonair, affable and courteous in manner, liberally disposed, [and] was highly respected and esteemed by all classes’. He was survived by his daughter, his wife having died in 1926, and was buried in St John’s cemetery. His estate was valued for probate at £4876. Print Publication Details: Peter Stops, ‘Gant, Tetley (1853 – 1928)’, Australian Dictionary of Biography, Volume 8, Melbourne University Press, 1981, pp 613-614.